Cottage style roof tile is a classic option, with tiles often featuring purple, red, mottled green, black and gray hues. The numerous colors available allow you to give "personality" to your roof and create a colorful, unique look. Tiles lap over one another to create a pattern, with a 3" lateral overlap the standard design. Inspired by Spanish missions, Old Mission is a type of convex and concave roof tile that creates a solid, very obvious pattern. Originally created by forming clay around a curved surface, such as the maker's thigh or a log, these semi-cylindrical tiles are laid in alternating columns. Today such tiles are made of metal, clay, plastic or concrete. A popular style in the American south and west, Mediterranean-style tile roofs are often flat or otherwise low-pitched. Tiles are barrel-shaped and overlap, and can last for many decades when properly installed. 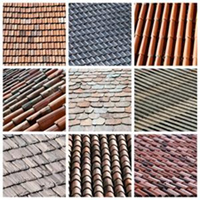 Also known as English or Cambridge-style roof tiles, flat tiles interlock and come in a number of shapes and colors. French versions of these tiles are slightly higher in profile and feature additional contouring; they create an Old World style roof. These are merely some of the many roof tile styles available! Talk with your roofing contractor to determine the best style for your needs, and enjoy the beauty and durability tile roofs provide. To learn more about tile roof installation and materials available through ProTech Roofing, please call (801) 691-7720 today. ProTech Roofing specializes in residential, commercial and governmental tile roof installation.